Healthy, low calorie and bursting with flavor…what more can you ask from a recipe!? This Blackened Shrimp Pasta is one of my favorite dinner recipes when I’m in a pinch for time but also wanting to eat something satisfying. I use my Veggetti spiral vegetable slicer all the time, honestly might like zucchini noodles better than actual pasta! 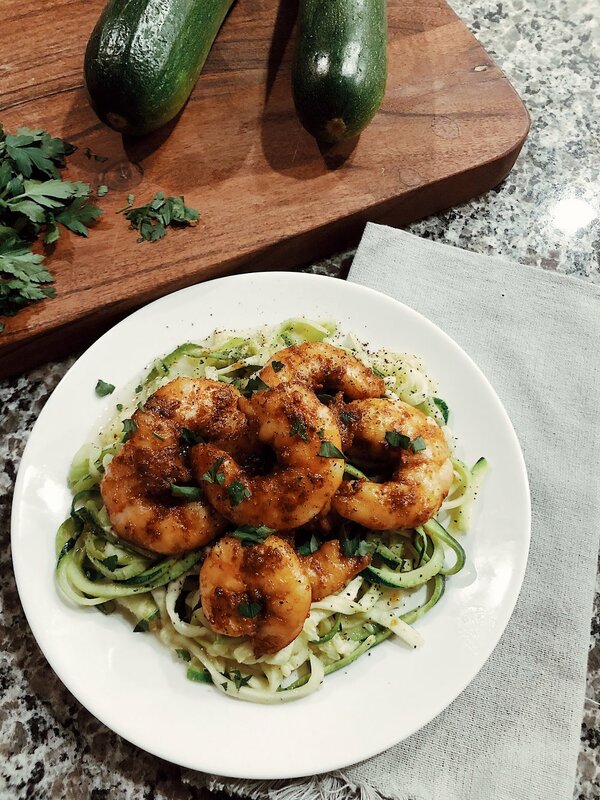 I hope you enjoy this tasty blackened creole seasoned shrimp on top of buttery zucchini noodles as much as me! Generously season the shrimp with blacked spices. Heat 1 Tbsp oil/butter at medium heat in a large pan (cast iron skillet is best) and add seasoned shrimp. Cook for about 2-3 minutes each side. While your shrimp is cooking, use your Veggetti to spiralize your zucchini into noodles. Heat 1Tbsp of oil/butter in a medium pan add zucchini noodles, season with salt and pepper, and let cook for a few minutes. I like my noodles a little more crisp so I don't leave them in long! You can add additional butter or sauce from shrimp skillet for additional flavor on your noodles. Enjoy! If you have any comments or questions, leave them below!